It was a great day for a parade in downtown Blue Springs. Blue skies and a little bit of a gentle breeze. There were several thousand Kids, Parents and Grand Parents lining the side walks. We had a great turnout with16 Tractors, 1Old Truck and a Lawn Tractor. 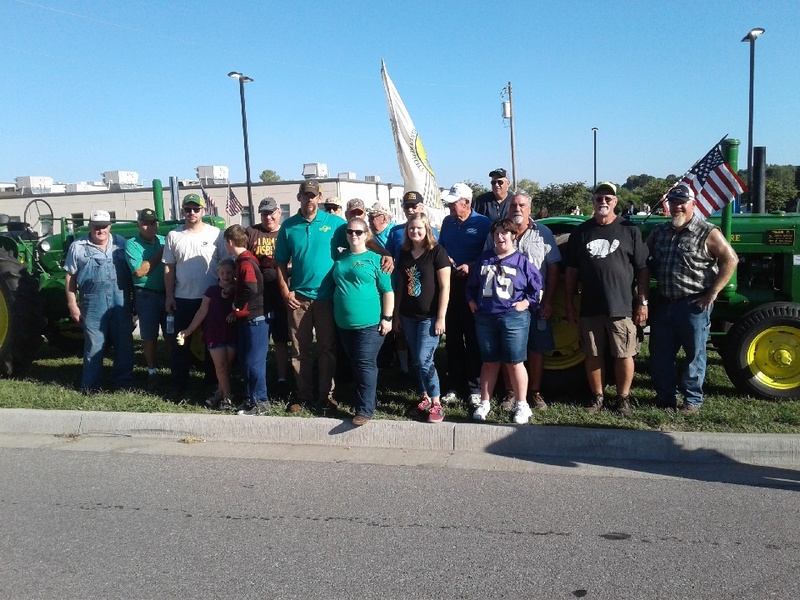 The following were in the parade, Lloyd Mesmer on a 1951 MM UTS, Justin Mooney on a 1948 JD B, Tom Bowlin and Miss Whit on a 1935 JD B, Troy and Melanie Moody and Miss Jade on a 1949 JD A, Troy Duncan on a 1952 JD A, Wes Stegner on a 1950 JD G, Francis Brenner on a 1950 Farmall H, Jerry Lee on a 1957 JD 620, Wes Storm on a 1949 JD D, Bob Antes and Addison on a 1960 JD 630, Sharon Antes an a 1959 JD 430, Gary Antes and Zack on a 1947 Farmall B, Ken Antes on a 1960 JD 530, Ron Brittian on a 1960 JD 830, Matt Willier on a 1966 Farmall 1206, John Peterson on a 1960 Porsche Super, Paul Owsley in his 1946 Chevy pickup and Fred and Mays on the Chigger Lawn Tractor. A special thanks to all who attended and made this a success.